The 30 Caliber Click Pen Kits are a great gift for the hunter in the family. These pens are designed to replicate a 30 caliber bullet shell. They have a click mechanism for retracting the pen tip. These pen kits are easy to make, attractive, and feature a scope style clip and your choice of 24k gold, Chrome or Gun Metal plating. The 30 Caliber Cartridge click pen kits use 8mm tubes and a Parker® Refill. They are turned on our pen mandrel using the cartridge click pen bushings. The 30 Caliber Twist Pen Kits pens are designed to replicate a 30 caliber bullet shell. They are easy to make, attractive, and feature a scope style clip. 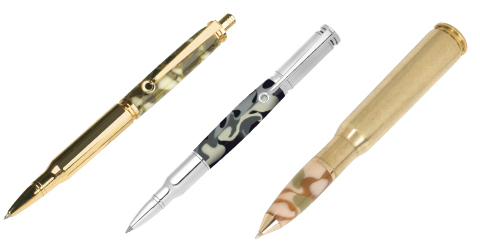 These pens have a twist mechanism and are available in 24k Gold, Gun Metal and Chrome finish. The pens use Parker® Refills, have 3/8" tubes, and are turned on our pen mandrel using the cartridge twist pen bushings. The 50 Caliber Cartridge Twist Pen Kit popular with military enthusiasts and outdoorsman. It is made from an authentic 50-caliber once-fired brass cartridge, with a 7mm tube, and a Cross™ style ballpoint mechanism. This project is an easy to make one of a kind project. The length of the turned section can be varied from 1-1/8" to 2" for a custom apperance. This project is turned on our standard pen mandrel with the 50 Caliber bushings.